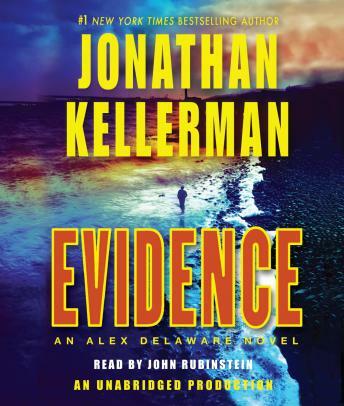 #1 New York Times bestselling author Jonathan Kellerman writes unforgettable tales of crime and detection that expose the shadowy side of glittering Los Angeles. And in Evidence, readers are once again in the dexterous grip of a master storyteller and stylist equally skilled at teasing your brain and taking your breath away. In the half-built skeleton of a monstrously vulgar mansion in one of L.A.’s toniest neighborhoods, a watchman stumbles on the bodies of a young couple–murdered in flagrante and left in a gruesome postmortem embrace. Though he’s cracked some of the city’s worst slayings, veteran homicide cop Milo Sturgis is still shocked at the grisly sight: a twisted crime that only Milo’s killer instincts–and psychologist Alex Delaware’s keen insights–can hope to solve. While the female victim’s identity remains a question mark, her companion is ID’d as eco-friendly architect Desmond Backer, who disdains the sort of grandiose superstructure he’s found dead in. And the late Mr. Backer, it’s revealed was also notorious for his power to seduce women. The rare exception is his ex-boss, Helga Gemein, who’s as indifferent to Desmond’s death as she apparently was to his advances. Though Milo and Alex place her on their short list of suspects, the deeper they dig for clues the longer the list grows. An elusive prince who appears to harbor decidedly American appetites, an eccentric blueblood with an ax to grind, one of Desmond’s restless ex-lovers and her cuckolded husband–all are in the homicidal mix spiced with eco-terrorism, arson, blackmail, conspiracy, and a vendetta that runs deep. But when the investigation veers suddenly in a startling direction, it’s the investigators who may wind up on the wrong end of a cornered predator’s final fury. So good, so good, so good!Milo and Alex are an unbeatable team!